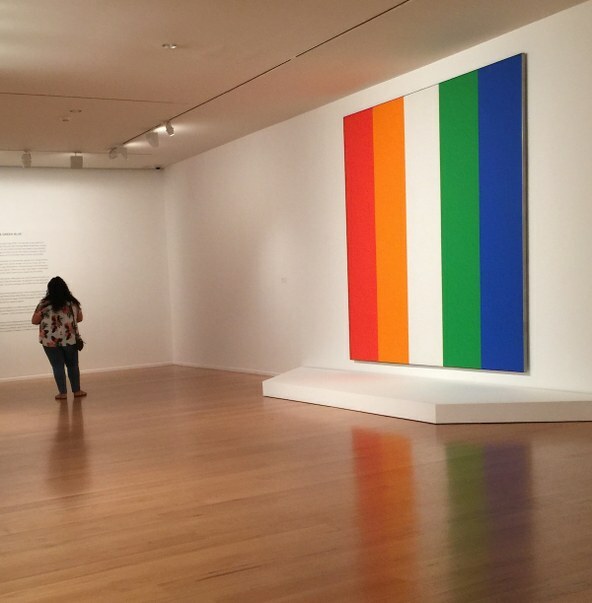 Any living artist who has two simultaneous museum shows would be, and should be, proud – but, here is the one and only Ellsworth Kelly (1923-2015), who is, almost three years after his death, still delivering mighty artistic punches. 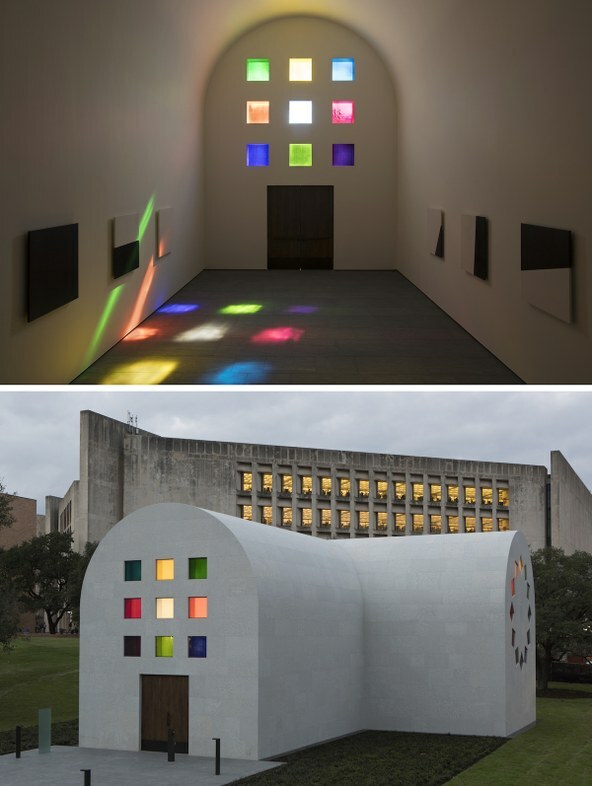 Top: Ellsworth Kelly, Austin, 2015 (Interior, facing south) Artist-designed building with installation of colored glass windows, black and white marble panels, and redwood. ©Ellsworth Kelly Foundation. Photo courtesy Blanton Museum of Art, The University of Texas at Austin. Bottom: Ellsworth Kelly, Austin, 2015 (Southeast view) Artist-designed building with installation of colored glass windows, black and white marble panels, and redwood totem. ©Ellsworth Kelly Foundation. Photo courtesy Blanton Museum of Art, The University of Texas at Austin. 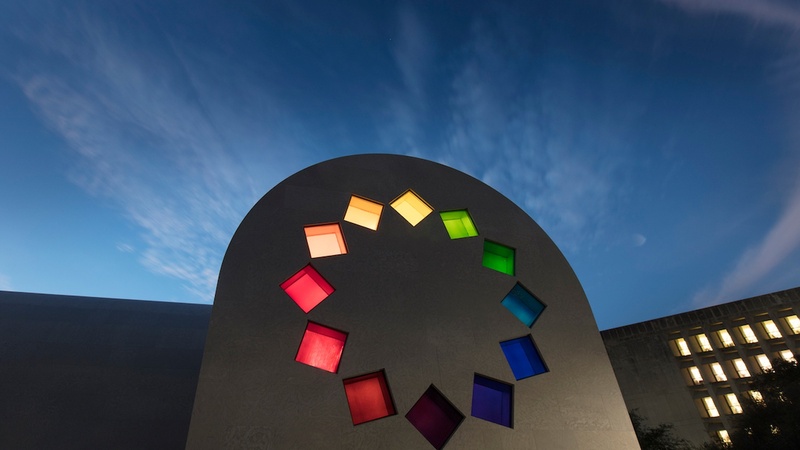 Blanton Museum of Art at the University of Texas at Austin recently unveiled Ellsworth Kelly’s new building with a single name – Austin – the design for which Kelly conceived in 1956 and finished in 2015, the last year of his life. The architecture of the building, its stained glass windows, and black and white marble panels on the walls transform this project into a chapel worshiping the gods of art. It calls to mind Matisse’s Rosary Chapel in Vence, France. There is an in-depth article about Kelly’s chapel in the May issue of Artforum International, which mentions the amusing fact that this project was originally designed for a Santa Barbara vineyard, here in Southern California. 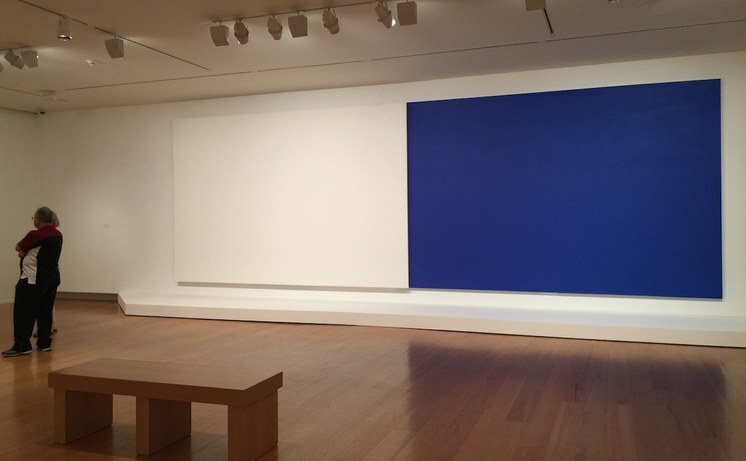 Installation shot, Line & Color: The Nature of Ellsworth Kelly, Norton Simon Museum. Pasadena, California. Photo by Edward Goldman. In a case of poetic coincidence, two local institutions – Norton Simon Museum and Long Beach Museum of Art – unveiled new exhibitions celebrating Kelly’s artistic genius. 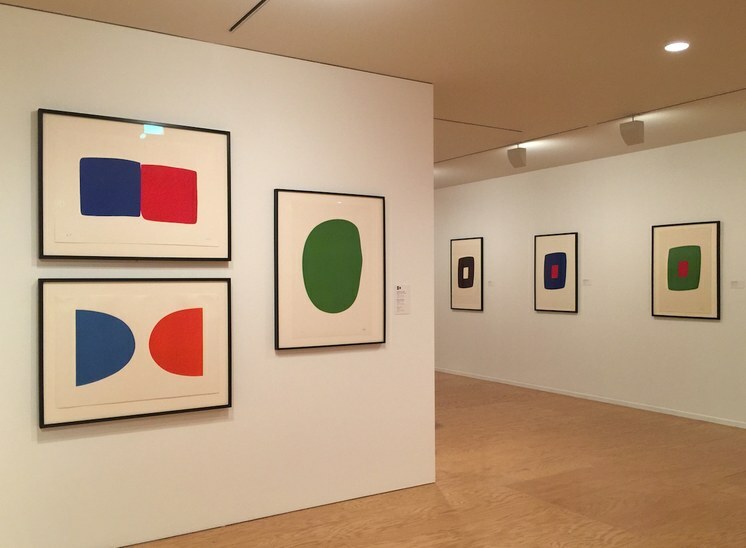 Norton Simon Museum presents two series of Kelly’s prints, both from the 1960s, Suite of Twenty-Seven Color Lithographs and Suite of Plant Lithographs. The abstract colors and flat surfaces of the first series and the linear nature of Kelly’s prints of plants couldn’t be more different. But, if they have something in common, it is their sense of editing and minimalism. The unique component of the exhibition is two monumental paintings by Kelly, which I had never seen before. His 30-foot-long White Over Blue was originally created for Montreal’s World Fair Expo in 1967, where it was installed vertically. Here, it’s presented as one long horizontal composition. As is the case with all great abstract artworks, it’s simply impossible to say which presentation is right or better. Left: Sketch for the painting Lemons and mimosas on a black background, 1944. Matisse. Right: Large head, 1949. Matisse. Images courtesy Long Beach Museum of Art. In 1948, Kelly moved to Paris, where he stayed for almost a decade, absorbing the art of European Masters. 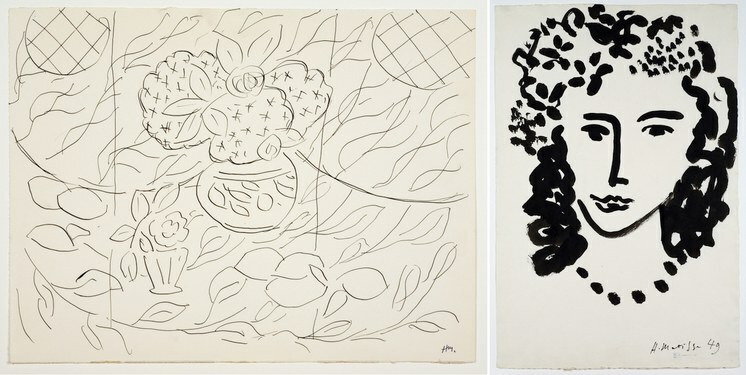 So, when you look at the series of his plant lithographs, with its linear drawings of plants, flowers, and fruits, one can see the influence of Matisse. To see convincing proof of this influence, you want to head to Long Beach Museum of Art, which just opened an exhibition of Matisse drawings curated by Ellsworth Kelly. Kelly also conceived this exhibition in the last year of his life, and Long Beach is the last of its 5 museum stops. Woman in a Chair, 1935. Matisse. Image courtesy Long Beach Museum of Art. 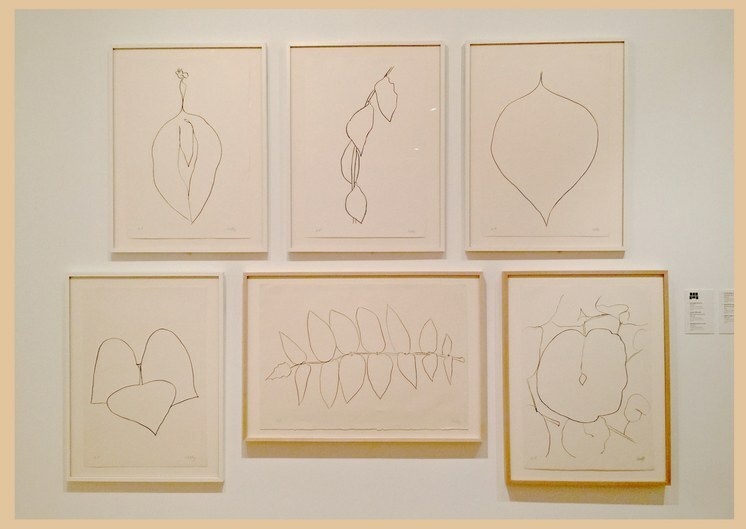 All the drawings are from the Pierre and Tana Matisse Foundation Collection, and the way the exhibition is installed is precisely the way Kelly conceived, with a particular sequence of drawings and spacing between them. 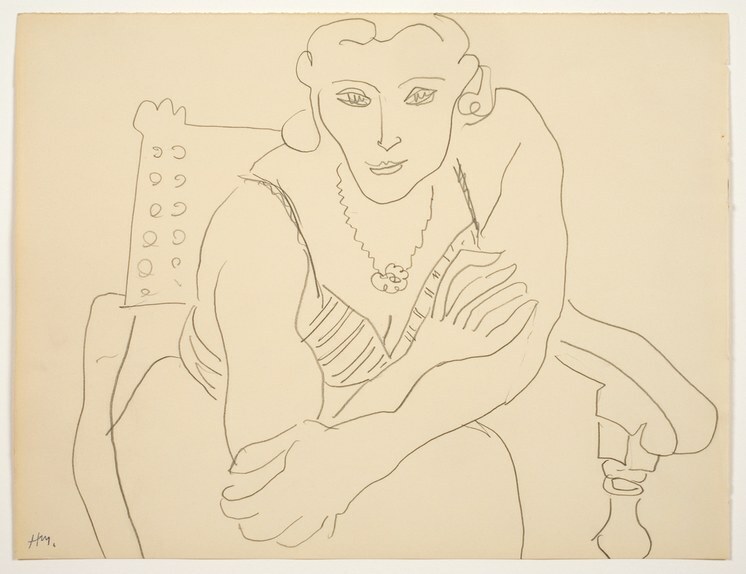 This exhibition is not only a rare chance to see several dozen Matisse drawings, but also to understand and experience the artistic love affair between two great artists.